Shannon Trail at Potton Cycle RouteThe Shannon Trail is a circular route that commences from the old Georgian town of Potton, which is situated in the east of Mid Bedfordshire. It leaves Potton along King Street and then winds its way in a clockwise direction through to the villages and hamlets of Gamlingay, the Hatleys, Croyden, Shingay, the Mordens, Wrestlingworth and Cockayne Hatley, before returning to Potton. Using country lanes and 'B' roads this beautiful route takes you through the open and rolling countryside of Bedfordshire and Cambridgeshire borders. The full route is well worthwhile, but should you wish, you can cut your cycling time slightly by taking the short cut through Guilden Morden, instead of cycling around Steeple Morden. Start / Finish Point: Market Square, Potton on the eastern borders of Bedfordshire and Cambridgeshire. Start Nat GR: TL224493. 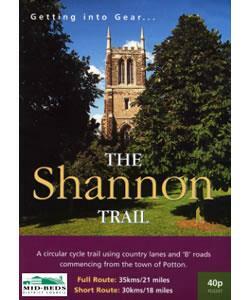 The Shannon Trail is a circular route that commences from the old Georgian town of Potton, which is situated in the east of Mid Bedfordshire. How to get there by car/parking: Potton is reached by the B1040 from Biggleswade and B1042 from Sandy. There is a free car park on Brook End off Royston Street.